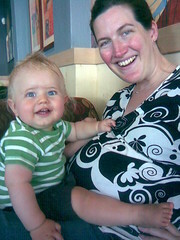 First day of maternity leave... - Time for a nice cup of tea? ,,, was perfect! A sleep in, coffee with Kerry and Jamie in our local Starbucks (looking forward to lots more of those!) and Jamie was cuddling up to the extreme bump! Lunch with mr.ncot at Juan Costa in the sun, a quick trip to Sihlcity for last minute bits and pieces and then a nap at home!